There is a good selection of accommodation awaiting visitors to Seville, being located within all of the most appealing areas of the city and categorised as hostales (hostels), pensiones (boarding houses) and fondas (inns). Hotels within the Barrio de Santa Cruz area of Seville are especially appealing and conveniently close to both the Prado de San Sebastian bus station and also the Alcázar Royal Palace (Alcázares Reales de Sevilla). Further hotels and similar lodging options are based within the El Arenal district, which is well-placed for access to the bus station at the Plaza de Armas, and within the heart of Seville - El Centro. Do bear in mind that this city prides itself on its lavish Holy Week (Semana Santa) celebrations, between Palm Sunday and Easter Sunday, when accommodation in the city is in great demand and room rates rise accordingly. The Feria de Abril (April Fair) is another busy time in the city when booking well ahead is essential. The high season for hotels in Seville falls between March and June, and again during the months of September and October. If you favour self-catering accommodation or are planning a long holiday, then a number of tourist flats are available in the city and are both well-equipped and particularly good value when shared with four people or more. 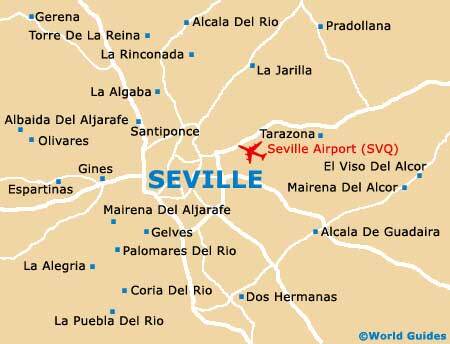 For budget lodging in Seville, an array of different accommodation options present themselves. These include the Hostal Arias on the Calle Mariana de Pineda, and also the cheap hotel named the Huéspedes Dulces Suenos, which is located on the Calle Santa Maria La Blanca and close to the action. Falling within the mid-range category, many reasonably priced hotels are easy to come by. Good choices include the centrally located Novotel Sevilla Marques Del Nervion on the Calle Eduardo Dato, and the Sevilla Congresos Hotel on the Avenida Alcalde Luis Urunuela, which is well-placed for access to the Palacio de Congresos y Exposiciones. For a taster of luxury accommodation, there are several five-star hotels in Seville that really do stand out. These are the Gran Melia Colon on the Canalejas, the Hotel Alfonso XIII on the San Fernando, and the Barcelo Renacimiento on the Island of Cartuja, which stands alongside the scenic banks of the Guadalquivir River.